pans (1/1 G/N, 65 mm). High-speed gas convection steamer with open style 1.5 gallon water reservoir located at the bottom of the cooking compartment for easy access and maintenance. 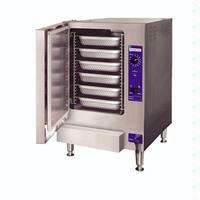 Fan forced convection steam with KleanShieldTM cooking compartment design. KleanShieldTM collects and removes condensate waste from the cooking compartment. This keeps the compartment clean, safe from impurities and easy to maintain. Reduces foaming and avoids contamination of the reservoir water. Automatic water level controls, fills when main power switch is turned ON, Low Water and High Water probes inside cooking compartment maintains water levels during cooking, eliminating the need to manually refill and monitor water level during cooking. Large overflow port in rear wall. 193 degree preheat and standby temperature. High Temperature Safety Shut-off. 62,000 BTU high efficency atmospheric gas boilerless style heating system. Front acess "works in a drawer" style burners for easy servicing. Includes a 60-Minute Electro-Mechanical Timer, LED Indicator Lights for Power On and Reset. Timed and Manual Bypass Switch for constant steaming. Exclusive SteamChef TM Automatic Drain Control. Compartment drains when main power is turned OFF via 1/2" ball valve with micro switch circuitry. simple 1" NPT drain connection required with water saving cold water condenser and 3 minute rinse feature. UL - Gas, UL - Sanitation (NSF Standards). (PN 16854) Perforated Steam Table Pan, stainless steel 12" x 20" x 4"
(PN 16868) Perforated Steam Table Pan, stainless steel 12" x 20" x 2-1/2"
(PN 16869) Solid Steam Table Pan, stainless steel 12" x 20" x 2 1/2"